Scooby-Doo is the star of a long-running cartoon and movie franchise that started in 1969 with the series Scooby-Doo, Where Are You! In the series Scooby-Doo is a Great Dane who, along with a group of four teenagers, hunts ghosts and the supernatural, although these usually turn out to be humans. The teenage gang are Daphne Blake, Velma Dinkley, Fred Jones, and Shaggy Rogers. They travel around in a psychedelically painted van named the "Mystery Machine." The term "Scooby Gang" was also used in Buffy the Vampire Slayer to refer to Buffy and her vampire-fighting friends. At the 2017 Upfronts presentation in New York, Jared and Jensen revealed that the main news of season 13 Supernatural would be an animated episode set in the universe of Scooby-Doo. This is episode 13.16 Scoobynatural which aired on 29th March 2018. It is based on the original Scooby-Doo, Where Are You! episode from season one "A Night of Fright Is No Delight." The majority of the dialogue for the animated episode was recorded in April 2017 by Jared, Jensen, and Misha before season 12 had finished filming. Dean: Old-school haunted houses, you know? Fog, and secret passageways... sissy British accents. Might even run into Fred and Daphne while we're inside. Mmm, Daphne. Love her. The VW van John Winchester nearly buys instead of the Impala is possibly a reference to the mode of transport known as the "Mystery Machine" used by the Scooby gang. Dean: Where is this little Scooby gang of yours? The character Fred Jones is named after Fred Jones from the Scooby-Doo series. In the episode Fred is psychokinetic, and has retreated into his mind with the encroachment of dementia. He is able to make manifest elements of the cartoon world in the real world. Ruh-roh! is Scooby's catch phrase. Dean: Listen Velma, this isn't the Scooby gang, okay. So either shut up or get out. Crowley: Easy tiger, just trying to help... I'm way more of a Daphne. Dean: Well, we'll have a look around. If it is Lucifer, we'll call the rest of the Scooby Gang. Sam puts on the Scooby-Doo, Where Are You! episode "Hassle in the Castle" for Dean to keep him distracted. Jack briefly watches the Scooby-Doo, Where Are You! episode "That Snow Ghost." The Scooby Gang in Scoobynatural. 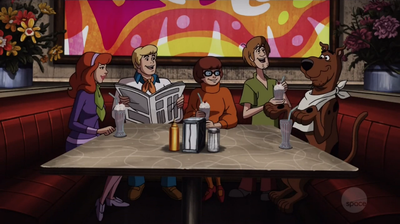 When Sam and Dean get pulled into a haunted TV they get from a pawn shop, they meet up with the Scooby gang at a diner. They join them as they head to Colonel Saunders's mansion, to hear what he has left Scooby in his will. At the mansion. Dean recognizes the episode of "Scooby-Doo, Where Are You!" that they're in. The attorney Cosgood Creeps reads the will, which states that they are all to stay the night in the mansion - which is haunted - to inherit the million dollars. Later that night they hear a scream and find Cousin Simple has been stabbed and died in his bed. From the large window, a shadow of a man is seen. He enters the room via the window and is revealed to be Castiel. Dean introduces him to all of them as his friend. The lights begin to flicker. Doors slam in the hallway. A ghost appears; Fred runs to it and just passes through it. The ghost leaves claw marks on the wall. Scooby is in Shaggy's arms and Shaggy is in Cas's arms. Fred finds a door and opens it to find Cosgood Creeps dead and in pieces. Fred thinks they should spread out and search for clues. Fred, Dean, and Daphne are in the library looking for clues. Dean sees a yellow book that is out of place. He pulls it out and a trap door opens, causing them to fall into the basement. The room is dark. Fred turns on the light and they see the ghost. 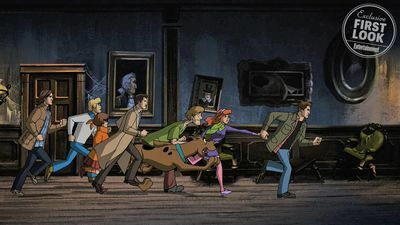 The ghost attacks Shaggy, Cas, and Scooby. Cas confronts it, and there are purple sparks. A chase ensues. After they crash into one another, they back into a room. Velma again takes over and declares she does not believe in ghosts. The ghost enters the room in darkness. Fred runs toward it and is thrown to the wall. Daphne and Velma are levitated in the air. Shaggy is thrown out the window, where he is holding on to a pole outside. When he falls, Scooby grabs him and Cas grabs his tail. They fall to the ground. Shaggy has broken his arm. Velma puts a splint on his arm and Daphne uses Fred's ascot for a sling. Dean tells them that ghosts are real. They have a hard time believing that. They're very upset. So Dean mentions their accomplishments from other episodes, which helps them calm down. Dean and Sam are in the car's trunk getting weapons for their fight. Scooby and Shaggy set up an elaborate trap which involves coconuts, iron chains, and a washing machine. The ghost comes in and it goes all wrong. The three of them get caught up in the trap. Plan B is to get it into the library. The ghost falls into the basement in a circle of salt. He can't get out. Then he turns into a little boy. The boy explains that when he died, his soul was tied to a pocketknife. Jay, from the pawn shop, found a way to control his spirit and use him to hurt people. Dean says that if he can get them home, they will release him from the knife. They peek out the door and see the gang upset. They emerge telling them that Velma was right it was not a ghost. They come in to see the attorney Cosgood Creeps wrapped up in the circle of salt. Dean comes in with a suitcase with the cash; it is Confederate money -- worthless. Cas touches Shaggy's arm and heals it.